Donut waffles are worth waking up early for. Few things are. I wake up early because I have to, because Christian surfs in the morning and I have small children to tend to. I do an exceptional job at tending them, feeding them cold cereal and nothing more. At best I'll make a real breakfast once a year, Father's day usually because Christian loves a good breakfast and I love Christian. I used to think that I was the norm and that most people couldn't care less about breakfast. But no, I am definitely the exception. People love breakfast, specially little people. My kids are in heaven. My kids who are used to only eating cold cereal are now getting donut waffles for breakfast among other more elaborate breakfast dishes that involve more ingredients than just cold cereal and milk. I get to wake up to good breakfast and a house full of beautiful happy kids. Mariko from the little foodie came over and made enough donut waffles to feed a small army. The recipe below is adapted from Eat my Cake now. Just out of curiosity what's your favorite breakfast food? Whisk the milk and yeast together in a large bowl and set aside for 5-10 minutes. In another bowl mix the flour and salt. In a smaller bowl whisk together the eggs and the vanilla and then stir the egg mixture into the yeast followed by the flour mixture. Cover with plastic wrap and let rise for 30 minutes. The mixture will be thick and elastic. Beat the butter and sugar together until creamy then stir into the dough and mix well. Cover and let rise for another 30 minutes. When the iron is hot scoop batter into the grid cook according to the instructions from your waffle iron. We love sourdough waffles! The sourdough originally belonged to my grandparents. 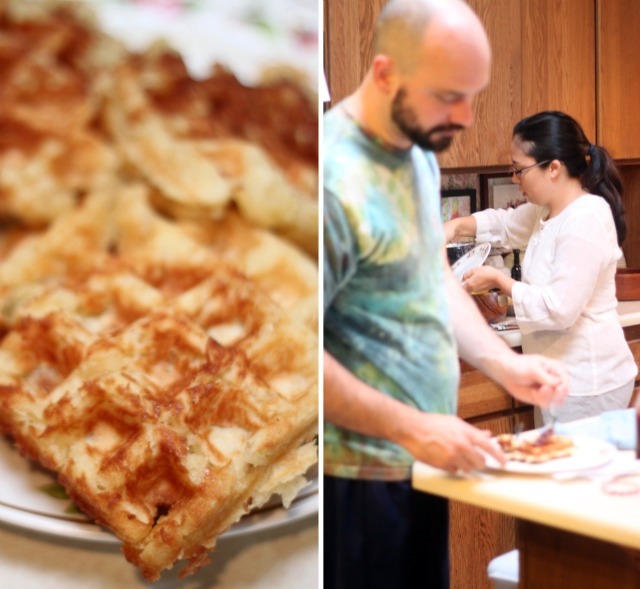 I got a small bit from my parents when I got married and you "feed" it water and flour to help it grow and then use 1 cup of that with a recipe to mix up the best waffles ever! These sound so yummy! I love both donuts and waffles so these are right up my alley. My favorite breakfast is french toast made from chullah. This is definitely a breakfast worth waking up for. I don't care too much for breakfast either...I don't get it. But these donut waffles..AMAZING! Thanks! Eggs, almost any way and steel cut oats with toast. Breakfast is my favorite meal of the day and I cook it almost every day. My least favorite is cold cereal with milk. Now, dinner I could care less about, just ate two clementines for mine tonight! Interesting = ) you most certainly have a house full = ) giving me some ideas about what to make for breakie for xmas am! I'm a big fan of a hot breakfast...my go to breakfast is a hold over from the days when everyone thought you should have bacon, eggs, hashbrowns and toast. I can never get enough of it. I want donut waffles. And that foot, that tiny little foot peeking out of the photo, well I could just eat that up! You sure are in the company of a pile of cute kids. I just need a waffle iron! I'm usually a cold cereal breakfast since it's so quick and easy but I also love me some spam,eggs and rice for breakfast! YUmmmmm! I am coming over! I used to make crepes or scones (biscuits in American terms) on weekends, but now with small bub in tow, it's just cereal or toast (on homemade bread though). Occasionally porridge if we're lucky. 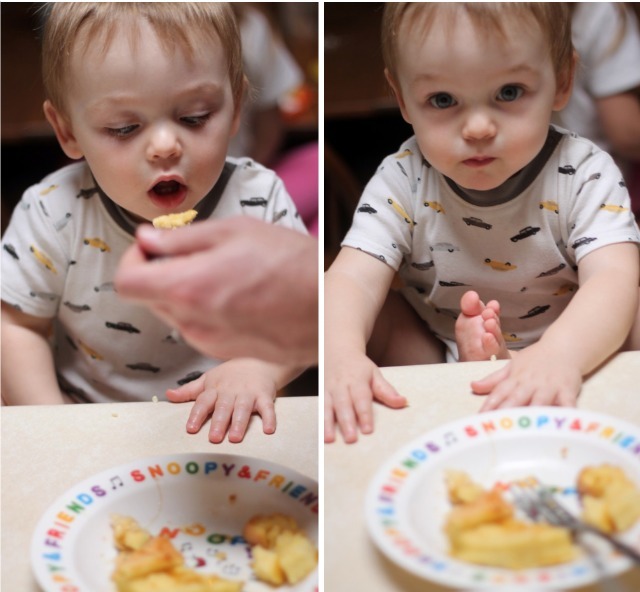 One day we'll get back to the tradition, maybe in a few months when the little guy is able to chew big boy food. Happy silly season and merry christmas Damaris! random question..how did you get your comments to get to "reply to comment"? Yum yum yum..I am going to make those tomorrow morning for Balazs...He will love it! My favourite breakfast is banana pancakes:) Yum! Merry Christmas Sweet friend! Meeting you through the blogland has been a highlight of my year! I love breakfast. And I love to sleep in. I don't have kids...so I can sleep in and I fee lucky at the moment. But if you need a babysitter to take care of ur kids sometimes while you sleep in...you can totally repay me with these donut waffles. Donut waffles...seriously ? The combination of the two things I like the most. Enjoy your holidays! These sound so good! Waffles of any variety are my favorite breakfast food, but I rarely make them. I'm adding these to the (all-too-sporadic) brunch rotation! I'm a HUGE breakfast person. The ideal breakfast must have meat- otherwise, I'm hungry an hour later:).